Unleash the hidden beauty of open spaces and facility exteriors with an elegantly molded concrete receptacle. The detailed, decorative craftsmanship of this 24 gallon trash receptacle acknowledges the beauty, confidence and strength of these spaces, while encouraging proper litter disposal. 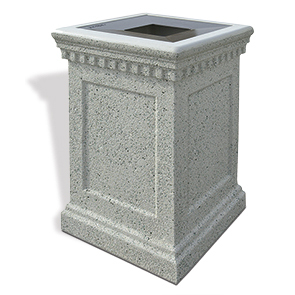 Constructed entirely with reinforced concrete, this sturdy receptacle will withstand the most demanding conditions while maintaining its original beauty. A pitch in aluminum top accents the attractive concrete design while encouraging proper waste disposal and concealing inside contents. Never worry about a missing lid, a security cable connects the lid to base of the receptacle.